 In the coming months we plan to mix older reviews in with new releases in upcoming episodes of The Confirmed Epic Podcast, so today I present to you the Nostalgia Bomb: a segment where we look back on elements surrounding a film release outside the actual film itself. 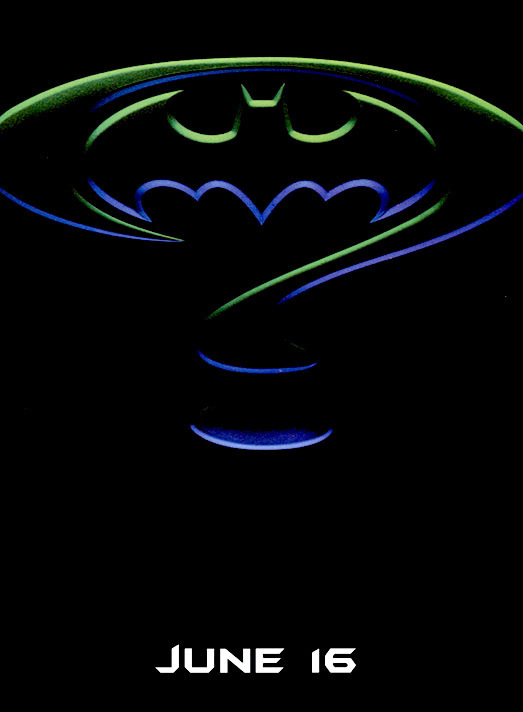 As we gear up for Episode 82 of The Confirmed Epic podcast where for the first time in a long time I will be joined by Jerry "Barbecue17" Reed, I thought now would be a good time to revel in some of the Nostalgia around our upcoming retro review of 1995's Batman Forever. Join us after the break as we look back on the films promotional partnerships, products, and marketing. 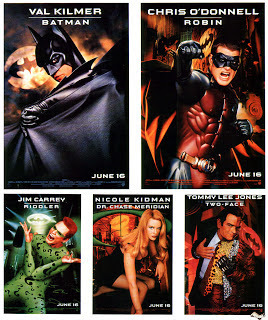 Batman Forever was the first Batman movie to completely revolve around the films villains, and supporting cast. Offering a star-studded line up of some of the biggest actors of the 1990's in iconic roles, it was the right Idea for the time. 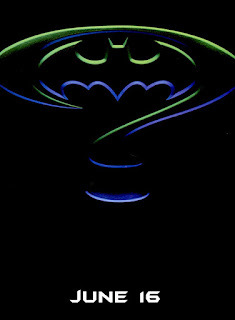 While the theatrical one sheet for the film left a little to be desired, there is no doubting the sure simplistic brilliance of the film's Bat Signal/Question Mark mash up for the teaser poster, that is arguably the best Batman teaser poster of all-time. 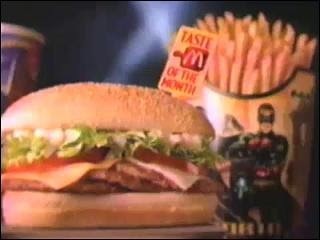 The most memorable Batman Forever ad campaign has the to be the McDonald's Marketing blitz for the 95 superhero blockbuster. There was nothing subtle about this campaign, as a line from the burger commercial made it into the film's opening scene, as the caped crusader ventures out to take on Two-Face, after uttering the now infamous: "I'll get drive thru." The Mickie-D's deal did not stop there, for this occasion Batman was given his own Burger. 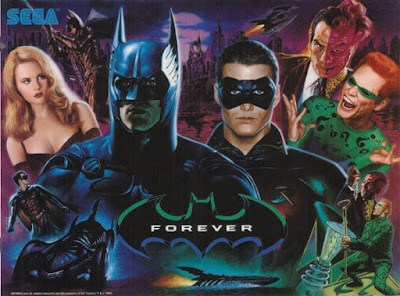 The Batman Forever burger featured 3 no beef patties on a sub like bun, the only logic I can decipher from this is that there was a patty for each major Batman film release up until that point. 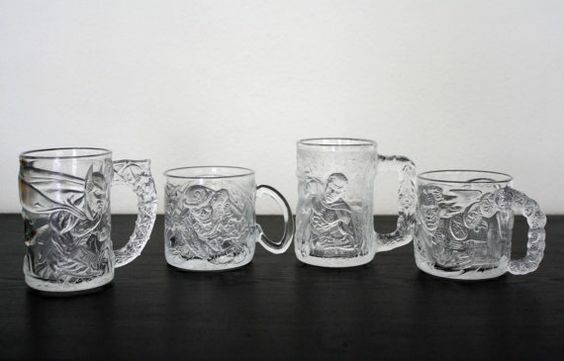 Not even a triple bat burger comes close to my favorite part of the fast food promotion: the set of 4 glass mugs featuring Batman, Robin, Two-Face, and The Riddler. At the time these mugs only retailed for 99 cents, these days a complete set can be had on eBay for around $30 in decent condition. At the time I had all four of these, and remember being enamored with them as I enjoyed large portions of Cherry Pepsi. 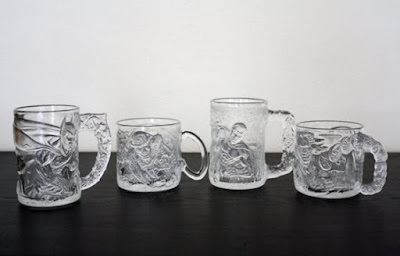 This is one of the few items looking back that still really holds up, the glasses had a nice hefty weight too them, and the designs were incredible incorporating major elements of each character. There were so many toys for the Schumacher Batman movies, I decided to just pick my favorite here, which was the Two-Face figure with prop replica coin. 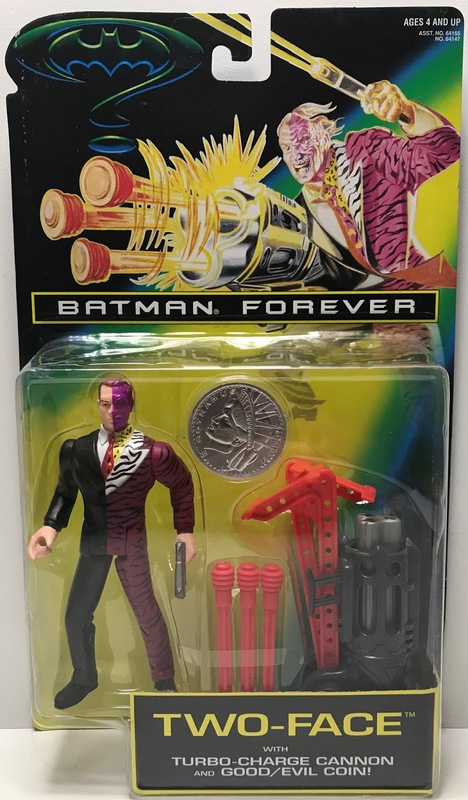 The big seller here for me is the coin, years after I had lost my figure, I always made sure to keep up with this Two-Face coin. I am guessing the reasoning behind the special bond is due to fact it was the first prop like collectible I ever owned. Until this day I still have my coin, meaning Kenner outdid themselves when it came to this cash grab. One of the first things that comes to mind when someone utters the infamous words: "Batman Forever" is the insanely difficult video game. Now while I would never consider myself Greg Miller or Colin Moriarty when it comes to video games expertise, I was not exactly a novice either. However when I received this game on Christmas morning 1995, my first thought was I should have been a lot worse, as a lump of coal would have been more entertaining. If my memory serves me correct I struggled with this game more than I did Mike Tyson's Punch Out for the original NES, resulting in me giving up after successfully beating the first level, this coming after dedicating my entire Christmas break to it. 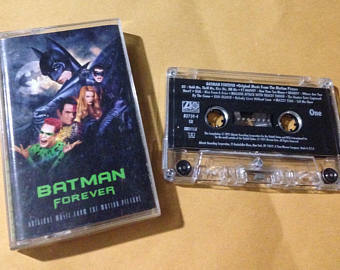 Featuring the diverse talents of such artist as U-2, Method Man, and Brandy the Batman Forever soundtrack ranks as one of the most memorable of the 1990's. As much talent that is featured on the album, they all pail in comparison to Seal's "Kiss From a Rose", the hit single that catapulted to the top of the charts after the music video release featuring scenes from the film. Personally I wore this tape out in the summer of 1995, even if my Aunt who was babysitting at the time thought that the pointy-eared man on the cover was Satan, yeah true story. 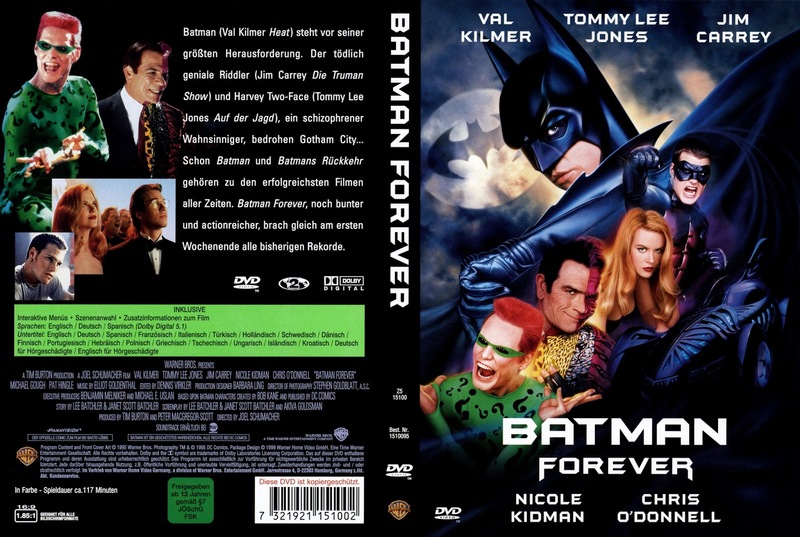 Just like most superhero movies of 90's Batman Forever featured a graphic novel adaptation. Personally I never really understood the appeal of these, as they were just direct retellings of a film. For comics like these artist never really allowed to take creative liberties resulting in what was basically a professional storyboard of the film. Full disclosure: I would also be lying if I told you I was not very tempted to pick this up at a con two years ago. Well the Nostalgia Bomb for 1995's Batman Forever has went off, we hope you enjoyed, and please stay tuned for our discussion of the film on Confirmed Epic Podcast #82. Please let us know your favorite Batman Forever memories in the comments below!